Every element of an organization, as it relates to marketing, can be divided into assets, neutrals and escalators. Assets are existing strengths that can accelerate marketing success, while escalators are weaknesses that require additional resources to build up and improve. Marketing Score @MKTScore is a free assessment tool and marketing intelligence engine PR 20/20 that automates the process. You provide insight into 10 core areas, and it delivers analysis and recommendations (coming soon) that drive results. The initial assessment takes 10-15 minutes to complete. Your profile information feeds our marketing intelligence engine, which makes recommendations based on company size, growth goals, industry, revenue, marketing budget and more. Profile data also will enable benchmark reports, which give you the ability to compare your Marketing Score, section-by-section, against similar organizations. Provide an assessment of your organization's marketing program, including core areas of performance, lead sources, marketing team, technology utilization, social media, content and public relations. Use the slider-bar rating system to score each factor. Simply click on a number, or drag the bar to your choice. All answers are auto-saved, so log out and come back anytime. Step 3. Review Your Report. PR 20/20's Marketing Score simplifies the analysis process by breaking down every factor into assets, neutrals and escalators. You provide insight into 10 core areas, and it delivers analysis and recommendations (coming soon) that drive results. 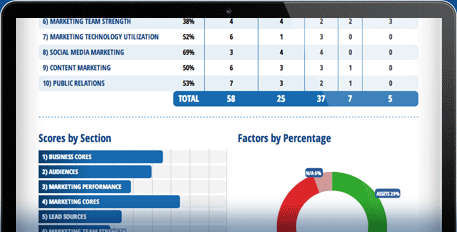 Print your report, or download it as a PDF, and view section-by-section summaries with scores and charts. Step 4. Improve Your Performance. Take action! Share your report with internal marketing and executive teams, invite co-workers to register and then compare your results, schedule a Marketing Score consultation (coming soon), attend an upcoming workshop (coming soon), and evolve your marketing technology, processes, strategies, talent and budget.